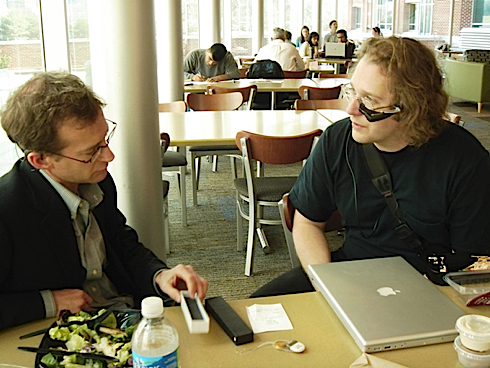 Thad Starner is one of several pioneers who have been personally experimenting with continuous visual input devices, sometime called wearable computing. To most people it looks like he has a screen attached to his eyeball. Starner wore his for years (as has others like Steve Mann, who started doing this earlier). They are living the dream/nightmare of being on the web 24/7, even while walking. So what is it like? As Thad Starner explained to me, distraction can be avoided by multiplexing rather than multitasking…. We have no difficulty absorbing all at once the music of a parade, the sight of uniformed marchers, bright sunlight, an autumn breeze, a pain in one’s knee, the smell and taste of hot dogs, and the clasp of a loved ones’s hand. I can think of other multiplexing combinations like driving a car while auditing to a book. In theory this should not work. How can you read and drive at the same time? I know that when I am listening to an audible book I am totally engaged. If it is a great book, I am transported to that world 100%. I would think my conscious mind would not be capable of doing anything else. Yet, I am pretty sure that my driving while listening to books is very safe. I must be multiplexing the two actions, though I don’t know what synergy they have. There seems to be some non-rival part of my brain that takes over the driving. That part of my brain has been driving for many years, and it has also been driving *while listening to books* for almost 30 years! (Zero accidents so far.) Both are fairly high-order tasks. I haven’t researched the science on auditing while driving so I don’t know if I am merely fooling myself, but it sure feels like multiplexing to me. We can listen to music while cooking. Some folks do bills while watching TV. There may be other multiplexing combinations I don’t know about. Is there an example of multiplexing you do? With a Masters of Science in IT I am no foreigner to technology, and in times past I have been amazed at what we have accomplished. Unfortunately I feel we are going in a direction that makes me concerned we might be making huge mistakes. We are already seeing this integration between humanity and machine through the use of smart phones etc, so I suppose this idea of ‘multiplexing’ is the next reasonable step. On one hand I am amazed, on the other I am fearful, are we indeed loosing touch with our humanity? Another example of multiplexing is doodling while listening – this has been shown to increase memory retention of the information shared. At what point does one cross the line between -plex and -task? I listen to podcasts all the time while doing “trivial tasks” like laundry, vacuuming the floors, biking to work, walking. I’ve noticed that I can not listen to podcasts while working (I’m a programmer) or even while shopping for groceries. It feels to me like it’s having to choose among options that makes me unable to focus on the podcast. Biking in traffic isn’t trivial but it is till just a lot of consecutive yes/no options. “Do I make it over before the truck or not?” They do not interrupt my listening. On the other hand, just buying mustard might give me 57 choices and as soon as the question “Wich one should I pick?” is in my head I no longer hear the podcast at all. Key Kevin, do you turn the radio down when you come to a complex intersection, or meet something unusual on your drive? I bet you do. Attention is limited, and executive control needs it. I know this literature pretty well, and there’s just no way doing more stuff doesn’t decay performance at any particular thing. There are some corner cases, certainly, but they’re small corners. Which is not to say that what is gained might not somehow be worth what is lost — going to the Met and being overwhelmed by all the art within your field of view is sort of part of how I experience art, moreso than full cognitive resources deployed to one particular piece. But claiming that task-specific processing is not impeded is contrary to at least two decades of empirical work. Shane, yes, when I am lost, I turn the books off. What are the corner cases? I’m thinking mostly of special “hacks” in the machinery to allow for seemingly paradoxical effects: visual indexing, the popout effect, the own-name effect, to name three that seem to break what might be seen as a linear scaling relationship (more items to deal with leads to linear decay in ability to deal with them.) These aren’t really ‘exceptions’ to the attentional model, as such, but they might be construed that way by someone trying to prove a point. You posted today something about Shannon and information theory, which I think is a nice way of framing this ‘multiplexing’ idea, especially if you consider multiplexing in its technical sense, where you have N streams interleaved together, s.t. it takes N units of time to get 1 unit from each of the N streams. From an information-theoretic standpoint, the information density of the multiplexed approach is the same as the single-stream approach, but that’s ignoring switching costs, which, again, have been shown many times to be substantial to the point of ruinous in prospective task-switchers. Kevin – It seems as though the examples you give are multitasking, not multiplexing (at least according to Starner – “Multiplexing means doing tasks that reinforce each other.”). While I listen to music or podcasts while I cook, and while I drive, anytime complexity enters into the task (either task) I have to divert my attention and focus. When ‘multiplexing’ (e.g. making notes regarding blogs, video, TV, conversations), as Starner points out, I’m actually reinforcing the primary activity. Also, it appears that you’re actually not driving as safely while auditing a book, you’ve just been safe enough. Music does not typically demand the same attention, so unless you’re ‘really into it’ at the moment, it generally doesn’t detract from your ability to drive safely. Fascinating. As for me, I find that certain kinds of music (minor key, new agey) actually help me write, which is to say, think, more fluidly. Other kinds of music (loud, fast tempo) help me get household tasks accomplished con gusto. I wonder what it’d be like if the Internet could talk to us. hmm. I listen to Democracy Now while field mapping in a database. I suppose the part of my brain that is used to “listen” to news is not rivalling the part of my brain used to seek out patterns. Walking through a place that I am going to storyboard to alter the set of sequential, multi-sensory cues that someone will experience, touching, smelling, turning, seeing the place as i talk into a digital recorder. The actions reinforce the thinking about what to change. You feel like your driving is unaffected because it is, to a large extent, automatic (someone who is just learning to drive would not experience anywhere near the same level of ease). Such mental automation is the reason for the widespread phenomenon of people forgetting large chunks or all of their drive home from work; we don’t pay attention to it so it’s like it never happened.